Congrats to Doreen who is the winner of the Pillsbury giveaway! What Pillsbury giveaway? Well..this one..sorta! I hadn't posted this giveaway yet-I was working on the Yoplait one-sadly..no one made it in before the deadline on that one, so I went ahead and submitted a coworker for it! THEN Miss Doreen was the FIRST to post after the deadline so I opted to go ahead and submit her for this awesome Pillsbury giveaway! 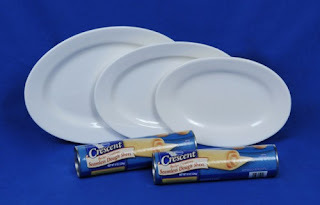 This giveaway product, information, and prize pack has been provided by Pillsbury and MyBlogSpark! Thanks guys! A roll of something Pillsbury is almost ALWAYS in our fridge...whether it's cresents (My favorite), cinnamon rolls (my husband's favorite), or biscuits (my go to quick pick)-we're stocked! My newest favorite thing to make with Pillsbury cresents? I call them Breakfast Pockets. And I'm so so sorry I don't have a photo....honestly..it went like this- Made new recipe Inhaled it Cursed myself for not taking a picture... Either way..this is how I made them..approximately..I really need to get better on measuring! You'll need- Two tubes of Pillsbury cresent rolls 1/2 lb sausage (cook it, then make a quick batch of sausage gravy-so flour and milk as well) 6 eggs (scrambled) 1/2 cup shredded cheddar cheese Set the oven to the temp that the Pillsbury roll of cresents instructs (I can't remember it off the top of my head) and give your baking sheet a spray of non-stick stuff (I don't think you really need it, but it really peeves me when those flakey cresents get stuck to my pan! So I take the safety precaution!) Unroll one roll of cresents and break them apart at the lines-lay them out on the baking sheet Top with about eh...2 Tablespoons of gravy, about the same of eggs, and however much cheese you want. Unroll the other tube, pull those apart and top your 'pockets' and pinch edges together to seal...then bake until they are golden brown! SO yummy! I made them for dinner one night, but of course they could be a perfect (and very portable) breakfast as well! Of course these could be easily adapted SO many different ways..I think the next time we might opt for no gravy and add in some onions and green peppers...yum! Pillsbury Cresents are seriously so versatile! Here are some other recipes I can't wait to try out! Cresent-Wrapped Brie and Cresent Bacon Cheese Tarlets! Even though we already have a winner, I'd still love to hear from you what YOU like to make with Pillsbury cresents (or other Pillsbury products! )!